Weebly pro plan is one of the premium plans offered by Weebly targeting medium scale consumers which will cost $12 per site per month. In this article we will discuss in detail about Weebly Pro features and pricing to help webmasters to understand whether Pro package is suitable for your need compared to the features offered versus pricing. Weebly offers many features only for Pro users and here is the complete list of Weebly Pro features discussed in detail along with pricing. If you are thinking of upgrading to Pro account then evaluate whether these features are suiting your requirements before deciding to upgrade your free account. Free hosting, site builder with unlimited pages. $100 Google AdWords advertising coupon for US and Canada users. 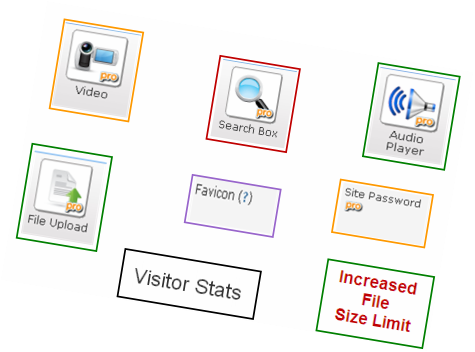 Expanded site statistics with site search box and password protection. Customizable footer with custom favicon. Self hosted video and audio players. With Weebly Pro you can convert your site into a music website by adding a HD video player and an audio player. Both the players are offered as an elements in the Weebly editor and can be embedded any place in your site by dragging and dropping the element. Learn more about HD video player and audio player. Header slideshow and multiple column drag and drop footer are the main attractions of the Pro package. Any individual page can be changed like a landing page with slideshow in the header and any element can be dropped inside the footer with multiple columns. Learn more about header slideshow and flexible footer. Pro package offers features like site statistics, editor permissions and password protected pages to administer your site much better. Multiple editors can maintain single site with different level of authorization and each page in a site can be protected with a common site level password. Enhanced site statistic provides integrated statistics to find the traffic and page views a period of a month. There are other features like favicon, file upload option in forms, increased size limit for file upload and site search to make your site looking perfectly professional. Weebly offers four different type of plans as mentioned below in order to fulfil various category of users. Out of which, Weebly Pro is one of the preferred plan by most of the users who wanted to upgrade compared to other plans especially those are not interested in paying three times for an eCommerce plans. Initial upgrade of any premium plan is available up to two years and you can upgrade subsequently with the same rate per month. 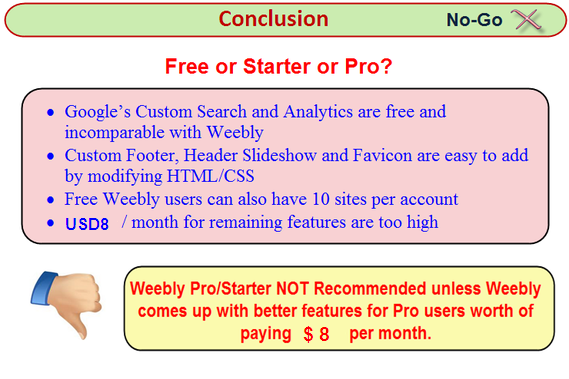 Below is the comparison of features of Weebly Pro and Starter plan. Undoubtedly pro plan has lot of additional and useful features especially if you are not interested in modifying source code to get some of these features. The pricing rate is different for 6 months, 1 year and 2 years plan. You can upgrade to the maximum period of 2 years at the beginning and extend it as per the existing rate. 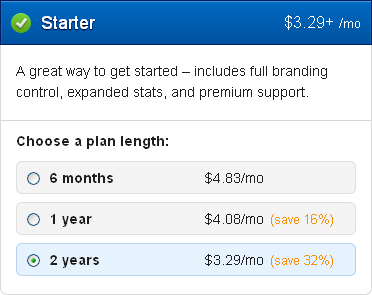 Here is the comparison of 6 months, one year and 2 years pricing for Pro and Starter plans. Weebly Pro – What Not? Unfortunately Weebly Pro package does not offer any additional options like premium themes and professional stock images. Also there are no additional ecommerce features and unlimited membership applicable to Pro users. Most importantly pro features like multiple column footer, header slideshow, site statistics, search, video and audio embedding can be added in a free weebly site without upgrading to pro either modifying HTML/CSS or using alternate options. Features like audio player and site statistics are not of core use to the webmasters to pay $12 per month. If you need more than one site with Pro features then you need to pay $12 multiplied by number of sites as Weebly Pro pricing is applicable on per site basis. Header slideshow option was removed from all responsive themes. Up to 100 memberships without registration option. Up to 25 product elements and checkout on Weebly domain with 3% transaction fee. No option to sell digital goods and offer coupons. Here are some important points for webmasters before considering upgrade to Weebly Pro account. 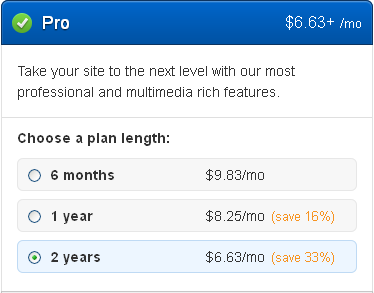 $8 for complete Pro features is too high where as the users can obtain many features for free with free account. If not upgraded subsequently any pro feature on your site will be deactivated. Weebly pro was an attractive package when it was introduced. Unfortunately now it is the least attractive among all premium plans offered. Even Weebly removed the header slideshow and did not provide user registration feature for pro users. Most importantly there were no considerable features added after the introduction of the pro plan years back. Weebly Pro pack contains various features to make your site more professional. But most of the features can be added in a free Weebly site by modifying source HTML/CSS code or readymade features like Google search and Google Analytics can be used for free. The pricing of more than $8 per month per site makes it more costlier compared to features offered by other service providers. Notably Weebly did not update any further features to its pro package since the time of pricing change.